Minimum order with your imprint, 250. Quantity variation +/- 5% is possible & billable. 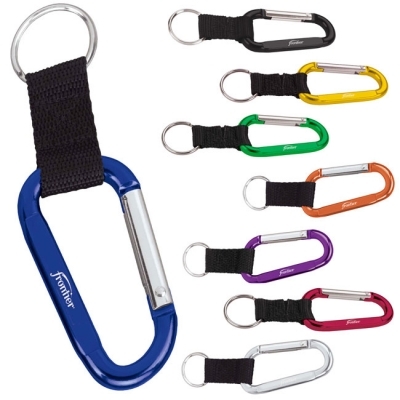 Brightly colored, these modern aluminum carabiner keyholders will be well received by those on your list! They are also a good trade show giveaway. Your company logo is likely to be enhanced by one of these colors of the rainbow. Product Size: 5-5/8"w x 1-5/8"h x 1/4"d.
Product Colors: Black, Blue, Gold, Green, Orange, Purple, Red, Silver. Laser Engrave: Front, 1-11/16"w x 1/8"h.
Options: Second side imprint at extra cost.